Web hosting is the service of providing storage space, bandwidth etc. for a website or application on a server on the internet. Once your website is made available on the internet, it can be accessed by other computers connected to the internet. A web hosting company rents web space with certain characteristics (disk space, monthly bandwidth, email accounts, databases, and other services)on the Internet to individuals and companies. These customers use their rented space to host websites, blogs, applications, storage facilities etc. Web hosting makes it possible for visitors to view your site’s content when they type in your domain name. But a Web hosting service accomplishes much more than that. It can help keep your site up — and running smoothly — 24/7. This is especially important in the competitive e-commerce marketplace, where interrupted availability may cause you to lose not only sales but also customers who will leave your site after a negative experience and potentially never come back. 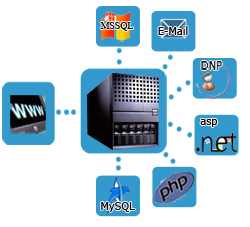 Shared Web hosting: Numerous sites are hosted on the same server. Reseller Web hosting: Clients are allowed to be Web hosts themselves. Dedicated Server: The client/user gains full control of the server, but often does not actually own the hardware. Virtual Private Servers: share one physical server but acts like multiple, separate servers. WordPress hosting: Increasing popularity of WordPress as a web building platform, many web hosting servers are offering what are referred to as “WordPress Hosting”. Statistics: A tool to monitor the access and visits to the pages of our website. Supported languages: PHP to ASP.NET, specify what types of programming languages that we use to write the pages of our website. WebMail: A tool to view your email online, in your browser. FTP Access: upload/download web contents to/from the server space allocated. Next post: What Type of Web Hosting Do I Need?